PHUKET: Police seized a Nissan Teana valued at over B1-million, 31 grams of crystal meth (ya ice), 3,506 methamphetamine pills (ya bah) four guns and various ammunition, a bankbook and drug-taking paraphernalia from four drug suspects who were arrested in and around Phuket Town on Monday and Tuesday (Oct 5-6). Region 8 Police Commissioner Lt Gen Tesha Siriwato (with microphone) announced the arrests and seizures at a press conference at Phuket Provincial Police Station yesterday afternoon (Oct 8). Region 8 Police Commissioner Lt Gen Tesha Siriwato announced the arrests and seizures at a press conference at Phuket Provincial Police Station yesterday afternoon (Oct 8). The arrests began with with 24-year-old Siripon “Ying” Raksakeaw at a room of the PSA Hotel in Poonpol Soi 3 at 1pm on Monday, when she was found in possession on two bags each containing .5g of ya ice. Siripon was charged with possession of a category 1 drug with intent to sell. During questioning, Siripon told police that she had bought the drugs from Anitwat “New” Chamnan, 30, who was also staying at the PSA Hotel. Police returned to the hotel at 3pm, searched Anitwat’s room and found six bags containing a total of 15g of ya ice, a homemade gun and three cartridges. Anitwat was charged for possession of a Category 1 drug with intent to sell and illegal possession of a firearm. 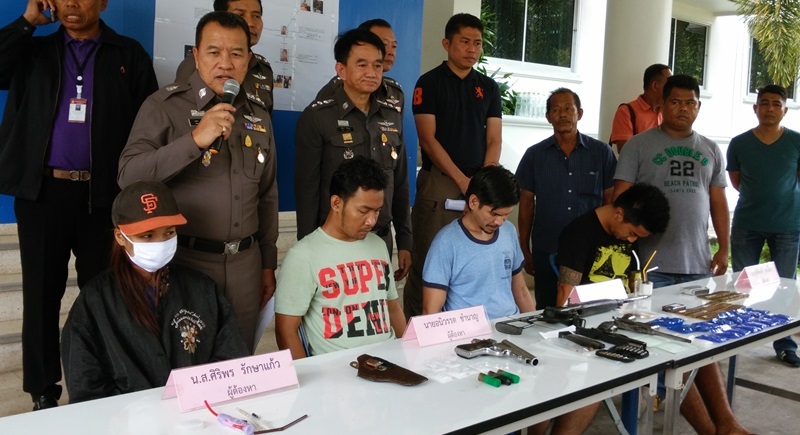 Later that night, Chaiyan “Den” Reungphet, 31, was arrested in Phuket Town in possession of 15g of ya ice, 18 packages containing 3,501 ya bah pills, a registered CZ semi-automatic pistol, an unregistered M1 carbine semi-automatic rifle, an unregistered Mauser C96 semi-automatic pistol and various ammunition. Police also seized from Chaiyan a Bangkok-registered Nissan Teana worth over B1-million and a bankbook for an account that at one point had more than B5-million paid into it. Chaiyan was charged with possession of Category 1 drugs with intent to sell, illegal possession of firearms and ammunition, and carrying a weapon in public without permission. Police are looking further into his bank account and how he bought the car. During questioning, Chaiyan told police that he bought the drugs from Kitipong “Nueng” Sealew. On Tuesday evening, police went to The Sky Hotel, also in the Poonpon area, where Kitipong was staying. Officers found six ya bah pills in his room. Kitipong denied that Chaiyan had bought the drugs from him. During a background check, police discovered that Kitipong had been previously arrested for drug and gun possession. For this latest incident, however, Kitipong was charged with possession of a Category 1 drug.